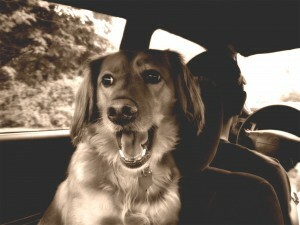 Here at Cabins of the Smoky Mountains, many of our rental cabins are pet-friendly. We don’t have restrictions on size, weight, numbers of animals or type (just don’t let your pet python get loose please!). All we ask is a deposit per each pet. Check our list of pet-friendly cabins. Lots of people take their pets with them when they travel nowadays. You can’t beat the company, and you can often come out ahead when you compare any additional expenses with the cost of a pet sitter – not to mention the guilt and worry. Most cats are not good travelers but many dogs love an adventure with their best friend. And here in the Smoky Mountains, in the middle of nature and surrounded by fantastic hiking trails, you’ll find no shortage of places to walk your dog! If you’re planning to bring your pets with you when you come here, please remember some golden rules of pet travel to keep everyone safe and happy. Tag your pets with your cell & home phone when you’re traveling. We often get lost pets wandering up to our various offices, and it can be very hard (or impossible) to find their owners. Avoid this heartache and stress for all concerned – tag them, please. New sounds, loud noises (from stormy weather, fireworks, music) or crowds of strangers in a new place may upset even the most seasoned pet traveler. Make sure to find some quiet, quality time with your companions – above all they love the sound of your voice and hanging with you. If you’re driving, make sure your pet doesn’t only think of the car as a trip to the vet. Make some practice runs with fun errands first. Consider a harness instead of a leash, it’s more gentle on the animal. And restrain the leash to the seat belt throughout the trip so that if you open a door unexpectedly the animal can’t run away. If they stray and get confused they can start heading for home, and it’s rare that they make it – far more animals get lost than ever find their way home. Don’t let pets stick their heads out the window at speed. They love it of course, but that debris in the air can hurt, and cause damage – why spoil a vacation? And please remember how both hot and cold temperatures get magnified in a stationary car. So don’t leave pets in parked cars (they can also get stolen). The first and final rule of traveling with your pets is: Have Fun! Stop frequently if driving and stretch everyone’s legs. And when you do finally get here, enjoy your cabin!